Biltmore Lake is a mountain lakeside development, built around the natural lake of the same name in scenic Asheville, North Carolina. Set on 1,300 acres at the foot of the Blue Ridge Mountains, this master-planned community is comprised of many different neighborhoods filled with people from diverse and dynamic backgrounds. These individual communities are not only connected by streets; but sidewalks, trails, and common areas run right through and promote encounters with neighbors and friends throughout. While each neighborhood is unique and people from all ages are welcome in Biltmore Lake, the lifestyle and amenities of this elegant community. 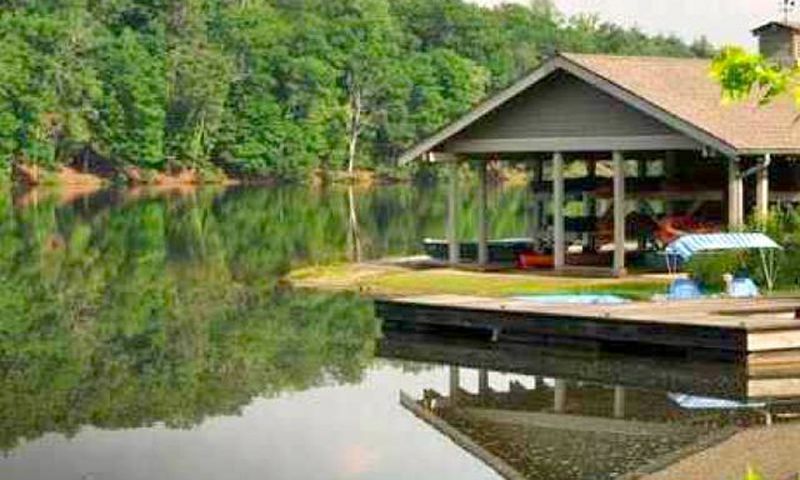 These amenities include a clubhouse and use of the lake for swimming, boating and fishing activities. In addition, a recreation director coordinates events which make life at Biltmore Lake a truly enriching experience. The natural 62-acre Biltmore Lake is the center of outdoor activity of this premier community. During the warm season, it is open for swimming and its sandy beach is perfect for spending relaxing days in the sun while enjoying the deep colors of the Blue Ridge Mountains reflected in the waters. Biltmore Lake is also available for boating (boat house with kayaks, canoes, and paddle boats is on site) as well as catch-and-release fishing. Miles of trails wind around the lake - perfect for evening strolls or scenic bike rides. With its idyllic mountain lodge atmosphere and a terrace that overlooks the water, the Biltmore Lake clubhouse has the perfect scenic setting. Indoors, the fireplace provides a cozy ambiance for residents to read a book from the exchange library. The clubhouse also includes free wireless connection. For outdoor activities, the clubhouse grounds include two tennis courts and a basketball court. There are over 1,000 homesites in this community. While Biltmore Lake was developed by Biltmore Farms, featured builders include Bass & Royster Builders Inc., Pebbledash Builders, Preish Construction Inc., and Wright Family Custom Homes LLC. New homesites are available in the Cedar Rock and Greenwells Glory neighborhoods, while other areas contain a changing assortment of resale inventory. There are a variety of floor plans among different collections ranging in size from 1,300 to 3,600 square feet. Attached townhomes can be found within the Rock Fish Cove neighborhood. These models can be found on a resale-only basis. With 2,279 to 2,659 square feet of living space and were built were two to three bedrooms, two-and-a-half bathrooms, and an attached two-car garage. Residents enjoy Biltmore Lake's townhomes as they offer main-level living and low-maintenance exteriors. The Cottage Collection includes eight models built throughout numerous neighborhoods. Ranging from 1,389 to 2,282 square feet, these single-family homes include two to four bedrooms, two to three bathrooms, and an attached garage. Homebuyers can build a new home from the Cottage Collection within the Greenwells Glory neighborhood. Otherwise, resale models can be found throughout the Laurel Ridge, Woods Edge, Scott's Ridge, and Whistler's Ridge neighborhoods. There are three single-family home models offered exclusively in the Cedar Rock neighborhood. This low-maintenance neighborhood includes new construction residences that range in size from 1,728 to 2,170 square feet. These homes include a variety of bonus level and basement options with two to five bedrooms, two to five bathrooms, and an attached two-car garage. Biltmore Lake offers a versatile lifestyle with tranquility and idyllic mountain character yet is only minutes away from the hustle and bustle of charming Asheville, North Carolina. It is an outdoor lover's paradise with the feel of a mountain retreat, but residents have plenty of opportunity to satisfy their urban needs with close access to dining, shopping, art, and music. Onsite, in addition to playing tennis, fishing and boating, residents also participate in many social activities. Biltmore Lake is in close proximity to the Blue Ridge Parkway, making it easy to explore Asheville and beyond. It is only 15 minutes to downtown Asheville. Besides shopping and dining establishments it is also home to River Arts District, where visitors can explore galleries and artist studios. Popular attractions in the Asheville area include Sliding Rock, Biltmore Estate, Thomas Wolfe Memorial, Looking Glass Rock, and the North Carolina Arboretum. Outdoor lovers have easy access to Bent Creek Forest's trails and will also enjoy nearby Pisgah National Forest and French Broad River. There are a variety of golf courses in a 30 minute radius. For a change of scenery, going east on I-40 will take residents to Charlotte while going west will take them to Knoxville, Tennessee. Biltmore Lake is a wonderful master-planned community in the Asheville, NC area. There are plenty of activities available in Biltmore Lake. Here is a sample of some of the clubs, activities and classes offered here. Attached townhomes can be found within the Rock Fish Cove neighborhood. These models can be found on a resale-only basis. With 2,279 to 2,659 square feet of living space and were built were two to three bedrooms, two-and-a-half bathrooms, and an attached two-car garage. Active adults enjoy Biltmore Lake's townhomes as they offer main level living and low-maintenance exteriors. The Cottage Collection includes 8 models built throughout numerous neighborhoods. Ranging from 1,389 to 2,282 square feet, these single-family homes include two to four bedrooms, two to three bathrooms, and an attached garage. Homebuyers can build a new home from the Cottage Collection within the Greenwells Glory neighborhood. Otherwise, resale models can be found throughout the Laurel Ridge, Woods Edge, Scott's Ridge, and Whistler's Ridge neighborhoods. There are three single-family home models offered within the Cedar Rock neighborhood. This low-maintenance neighborhood includes new construction residences that range in size from 1,728 to 2,170 square feet. These homes include a variety of bonus level and basement options with two to five bedrooms, two to five bathrooms, and an attached two-car garage. Asheville is heaven on earth. We've lived here for our whole lives and would never consider moving away. It's so beautiful and peaceful! This community is perfect for nature lovers. Our Cottage home is gorgeous, our yard is beautiful and the views are fantastic. It's a joy to live here! 55places.com is not affiliated with the developer(s) or homeowners association of Biltmore Lake. The information you submit is distributed to a 55places.com Partner Agent, who is a licensed real estate agent. The information regarding Biltmore Lake has not been verified or approved by the developer or homeowners association. Please verify all information prior to purchasing. 55places.com is not responsible for any errors regarding the information displayed on this website.